Whether you love or hate football season, it’s hard to deny the appeal of the overindulgent category of snacks and desserts that is “game day food”. So I’m kind of going to skip over any complaining about or praise of any other aspect of televised college and NFL football–I’m sure there are sports blogs for that, right? The important thing is finding snack and dessert recipes that, first and foremost, feel super rich and comforting. A couple other lesser criteria for me: I prefer not to feel like total crap after consuming said snacks, so it’s nice to find things that are not coated in batter and deep-fried or laden with enough sugar to give your dentist a coronary. And while I will share that I’m hardly interested in the game, just having it on makes the day feel slightly lounge-y, and I would rather not spend 9 hours in the kitchen. So, we have–comfort food feeling, nutrition in disguise, and reasonably quick to prepare. 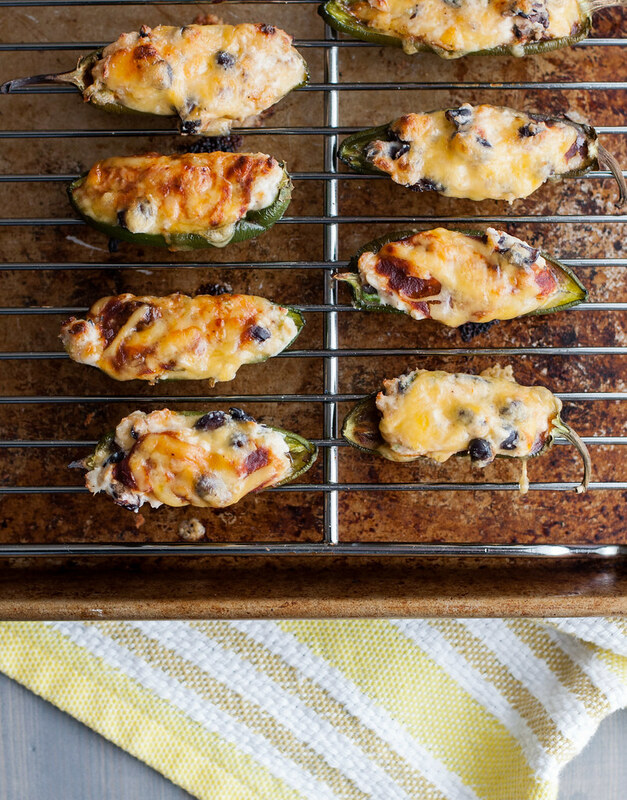 The answer: these BBQ black bean jalapeno poppers. Let me tell you how they stack up to each criteria. 1. 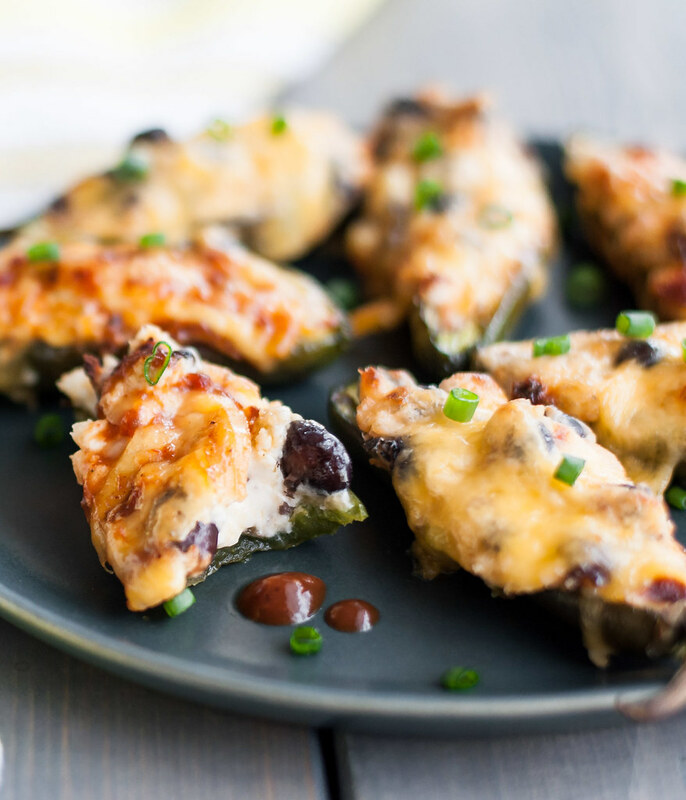 Comfort food: sweet, smoky barbecue sauce; a little spicy heat from the jalapenos; smooth, creamy, melty cheese (how many times have you been forced to read the only six adjectives in existence that describe melty cheese during your recipe search?). Check. 2. 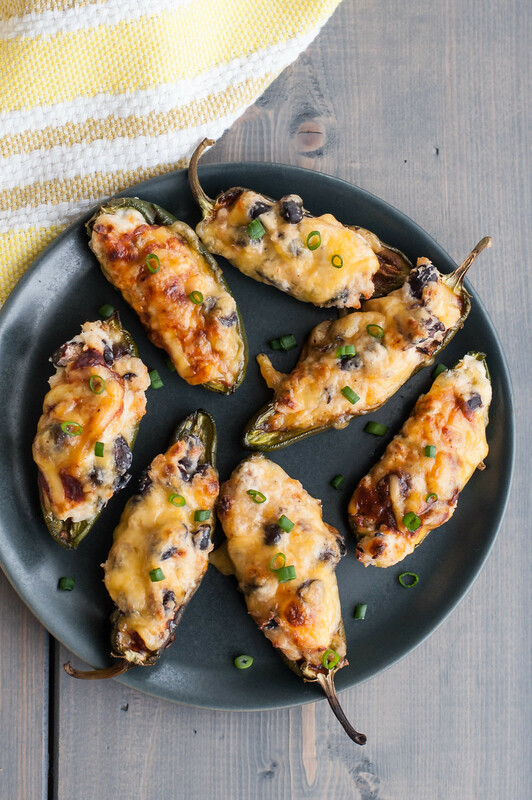 Not a heart attack on a plate: no frying here–just roasted, still crunchy jalapeno peppers; black beans take up space in the filling, so you’re not getting just cheese and you can even claim a protein boost if it makes you feel good; also, I chose not to wrap them in bacon. You’re welcome. 3. Speed and ease: the peppers do a little pre-roasting while you get the filling ready; no food processor or mixer required (I did everything by hand); I’ll only admit that seeding the jalapenos is a little tiresome, but nothing obnoxious, so check number three. A perfect lounge day or game day snack—total comfort food, not entirely diet-ruining and quick to prepare! Heat the oven to 425 degrees, and line a rimmed baking sheet with foil. Halve the jalapenos lengthwise, leaving the stems on (for looks and as a handle). If you’re detailed and want the poppers to sit flat: let each pepper roll to a stop on the cutting board. Roll another 90 degrees, then halve. This way, it will lay on the flat side you found! Use a small, sharp knife to remove the seeds and white membranes, unless you like the peppers super hot. Use caution and gloves when handling jalapenos! 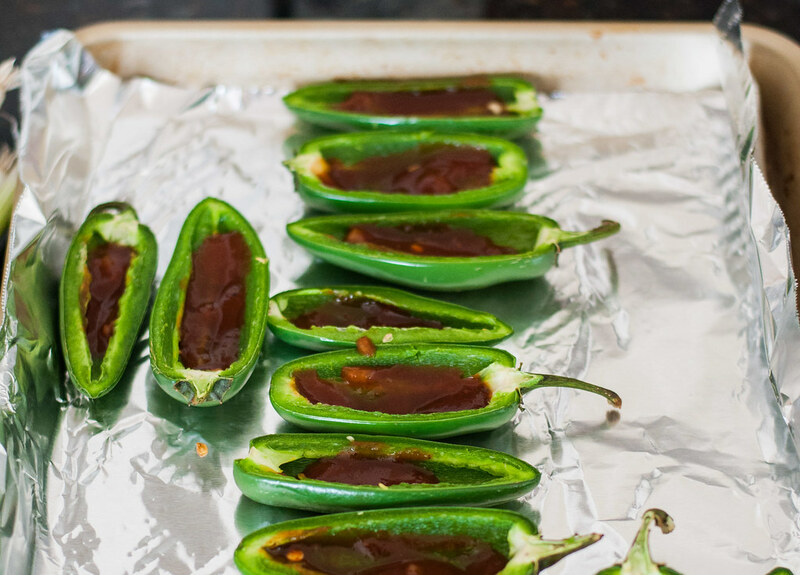 Arrange jalapenos cut side up on the baking sheet and roast in the oven for 5 minutes. Rotate the tray, then roast another 5 minutes, until skins are beginning to brown and blister. Remove peppers and reduce oven to 375 degrees. 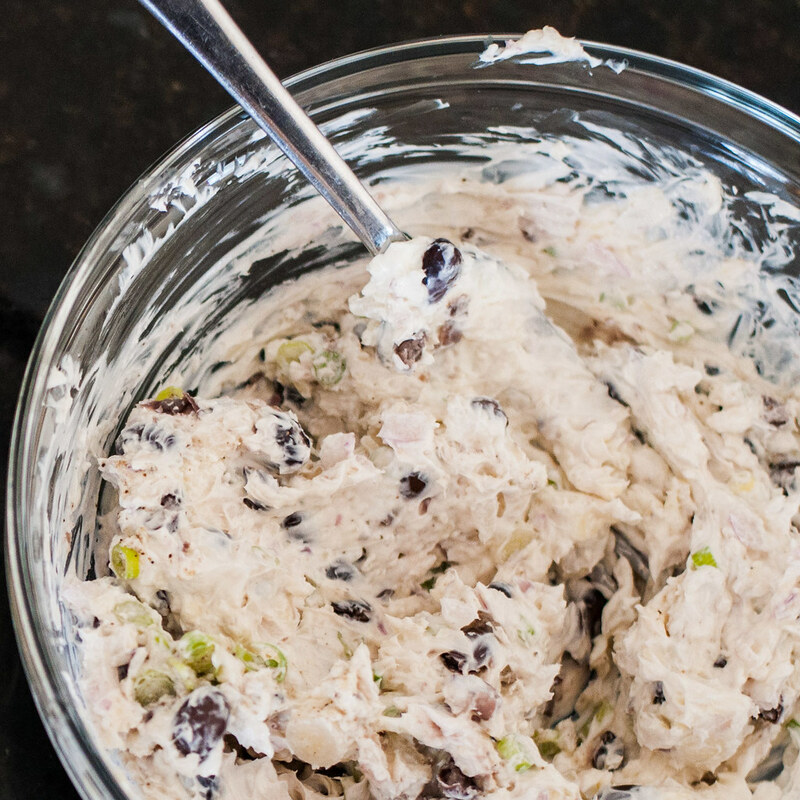 To make the filling, mix the cream cheese, ⅔ C of the cheddar, black beans, scallions, ½ t salt, and ¼ t pepper. You don’t need to be delicate—some of the beans should get smashed. Fill each roasted pepper half with about ¼ teaspoon BBQ sauce, spreading it with the spoon to fill the bottom. Then use a regular table spoon (the eating kind, not the measuring kind), to scoop out a heaping tablespoon of filling along the long edge of the spoon. 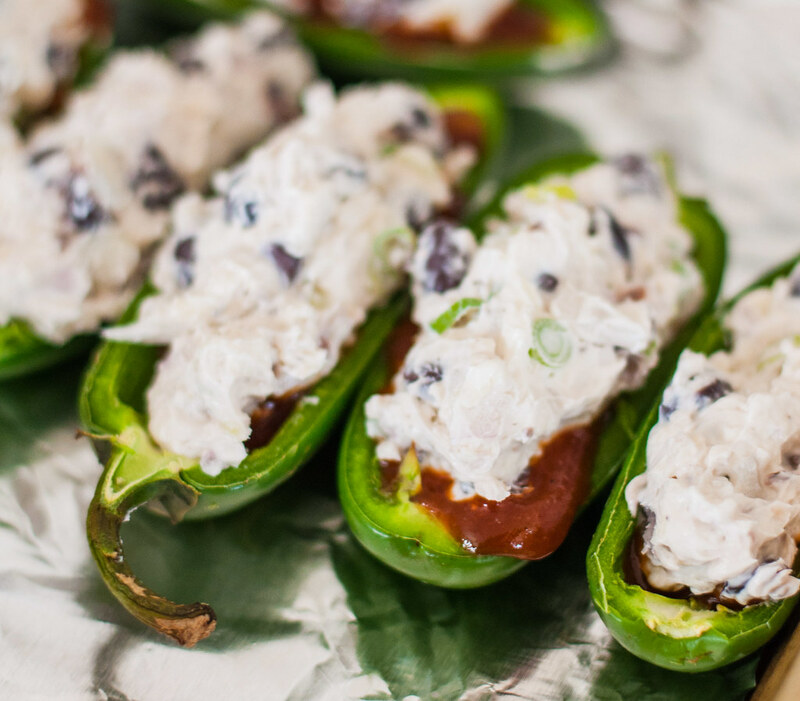 This makes it easier to just push the filling off the spoon and into the cavity of the jalapeno (alternatively, you can pipe the softened filling into the poppers using the large tip on a pastry bag). Use the back of the spoon or wet fingers to push the filling down into the cavity. Continue filling the peppers, using up all the filling. Sprinkle with the remaining ⅓ C cheddar. 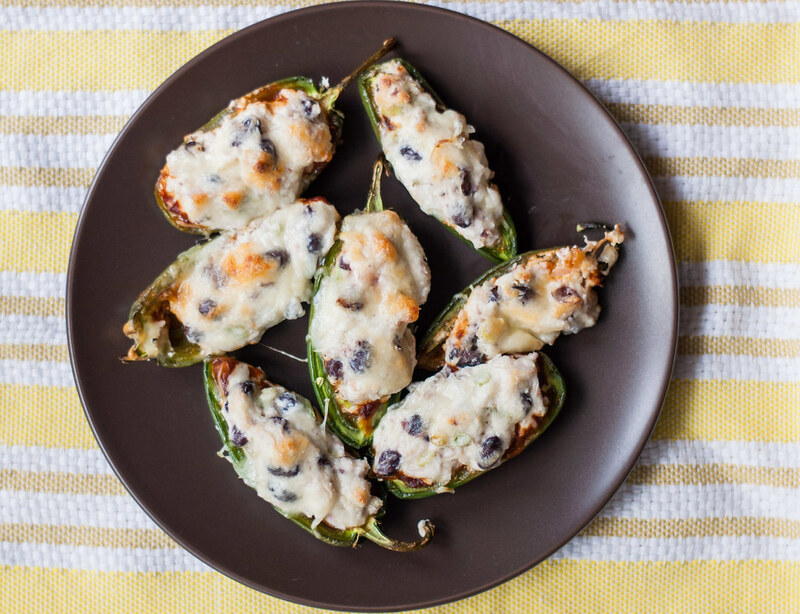 Put peppers back in the oven for 10 minutes, until the filling is bubbly and the cheese on top is melted. To brown the cheese, place about 6 inches from the broiler for a few minutes, watching carefully so the cheese doesn't burn. Serve alone, or with extra BBQ sauce, ranch, or chopped scallions. To soften cream cheese, either leave at room temperature for an hour, or heat in the microwave at 50% power in 30 second intervals until just pliable (not warm). 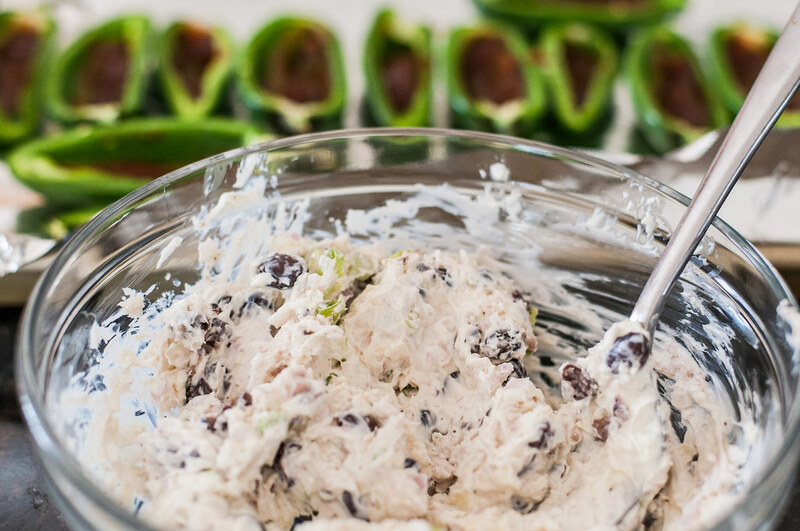 For extra BBQ flavor, mix a couple tablespoons of sauce into the cream cheese filling. 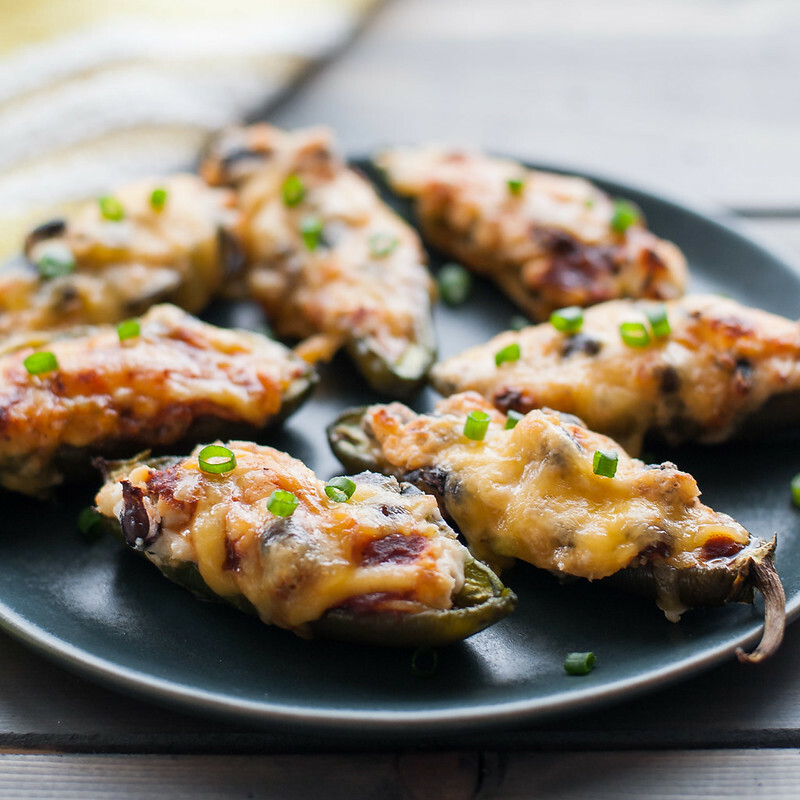 I feel like I’ve been putting jalapeno in everything lately – these poppers sound like a great way to get my fix! Definitely–I’m not sure if it varies around the country (probably not since I’m guessing most of them aren’t grown in the U.S.) but they seem to be SUPER spicy this season, too! Hi Tessa, I just saw these yummies featured at TK! 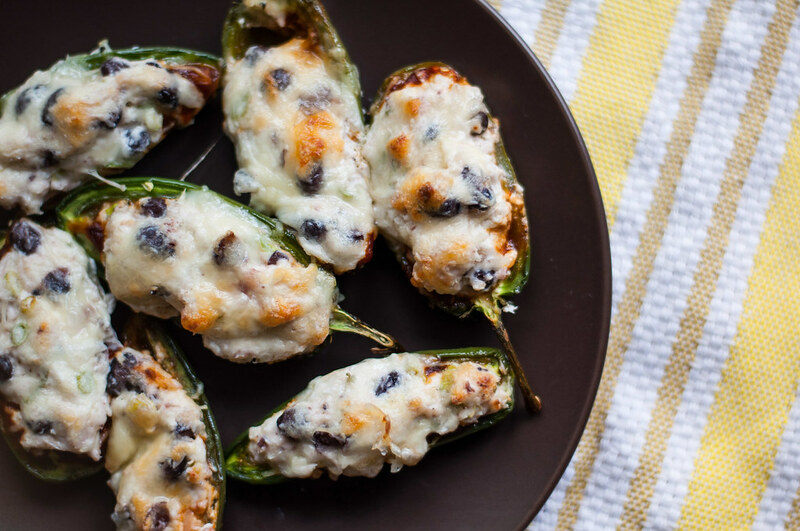 I love that these poppers are roasted, and the filling…de-lish! Thanks Kari! Honestly, not my best photography effort (I snapped a few quickies as the recipe materialized), but thanks for checking them out regardless! Look for improved photos to come. Tessa, this is genius! 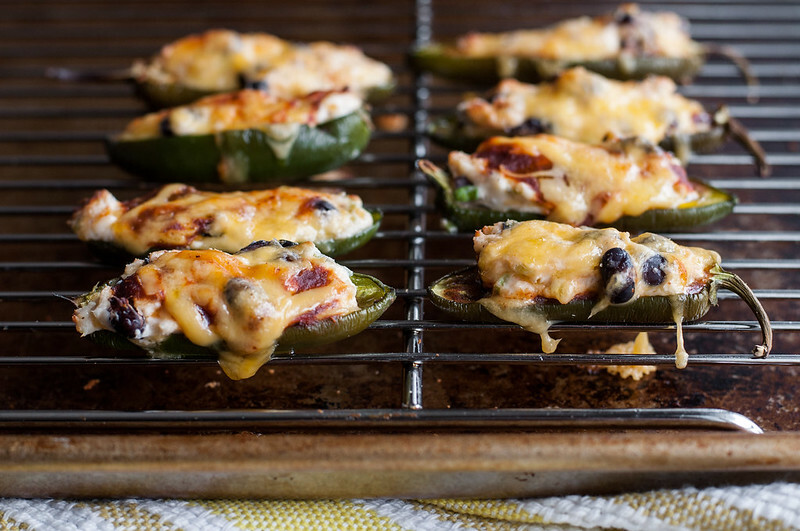 I am headed out to buy some jalapeno peppers and make these right now. Thanks so much for your creativity! Thanks Jen! Hope they were tasty :) All the peppers I’ve been getting around here lately have been extra spicy so be careful!